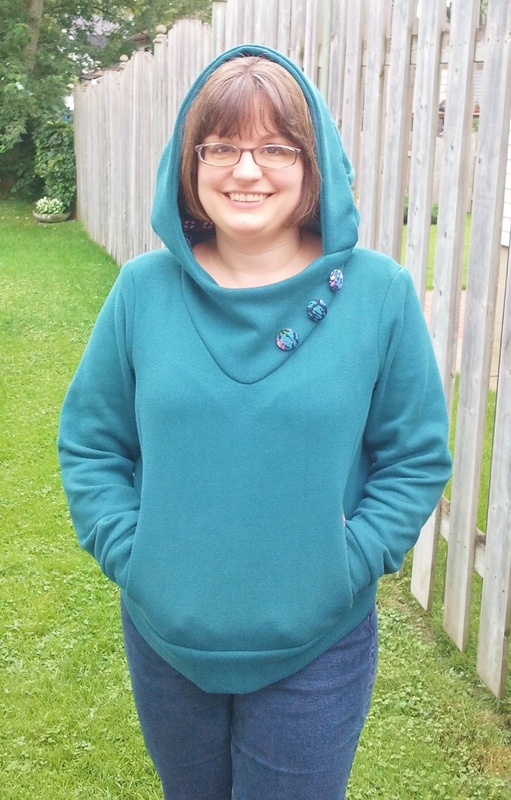 Following The Thread: My Sew Indie Month Jasper Bunnyhug! My Sew Indie Month Jasper Bunnyhug! 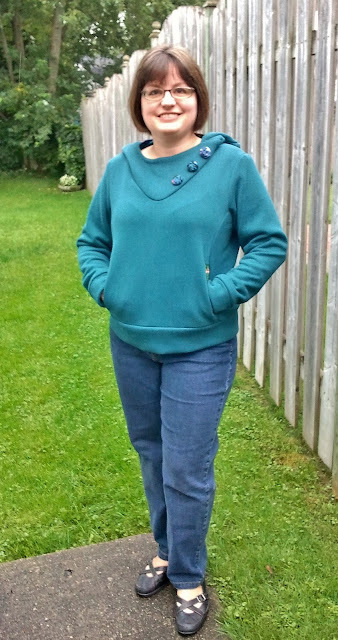 So glad it's Friday and I've got a chance to show you my new Jasper Bunnyhug, a pattern by Paprika Patterns which I received as part of the Sew Indie Month pattern bundle #2. I shared some info about this bundle in my last post but wanted to share it again -- from now until Sept 10, you can buy up to 10 patterns for a very good price indeed. More on that later! 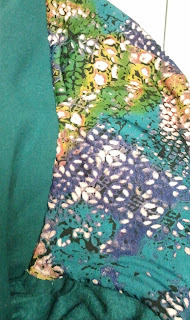 I've never worked with sweatshirt fabric before, but I had this lovely blue stuff in my stash, from a sale last fall. So using that and some knit scraps from an earlier project, I made up this Jasper. 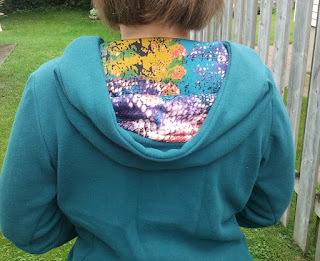 The pattern was really clear, with additional help via tutorials on Paprika Patterns' blog. 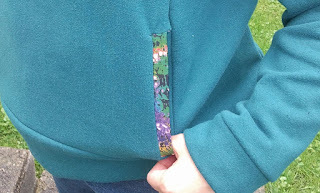 I was really glad for the extra photos when putting the welt pocket in -- somehow I just couldn't get it, and had to read through and examine the detailed instructions a few times! I did eventually get it finished, and it is mostly straight, haha. I used bits of the coloured knit for the welts, the covered buttons and to line the hood. 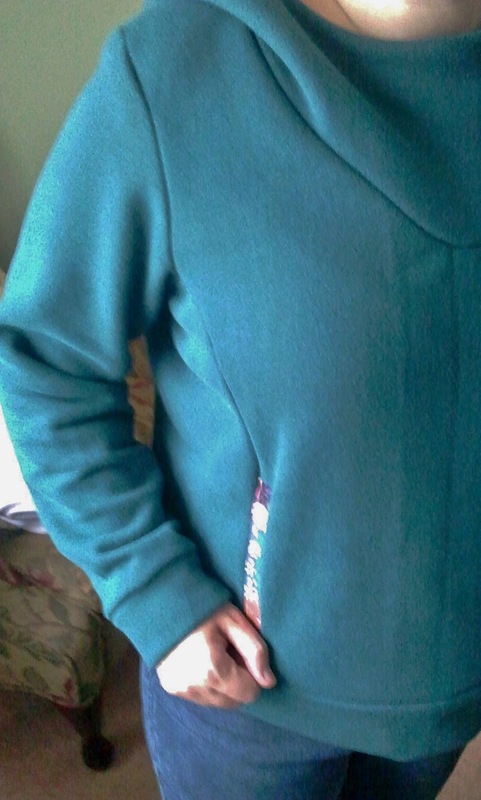 Lining the hood was my own adaptation. 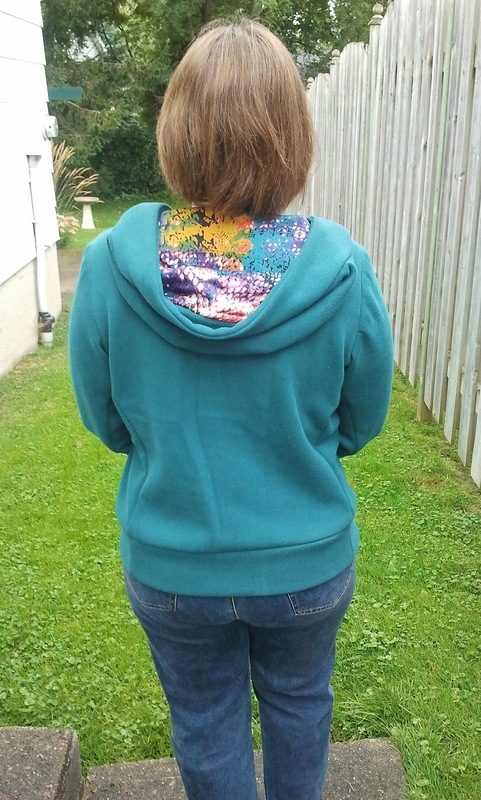 I just thought it would add a little more colour in to this top, and wouldn't stick to my hair as much if I had the hood up. It was also a very handy way to finish the neckline and hood seams; I trimmed the sweatshirt fabric closely, and folded the edge of the stretchier knit over what was left, and then hand-stitched it down all around. It didn't take long and it looks very clean and tidy. And I love the hit of colour. 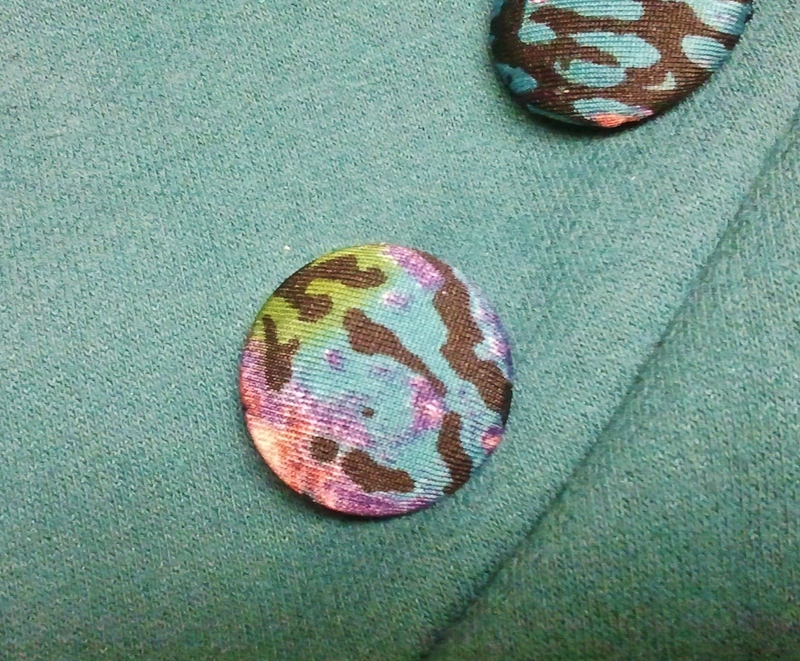 I also made my own covered buttons using the same knit. I'd read a tip somewhere that adding some batting under the top of the button made the buttons cover more smoothly -- well, I didn't have batting but I did have lots of sweatshirt scraps, so I cut a circle the size of the button for each. I think they look pretty nice. I knew those covered button kits from the thrift store would come in handy! This is a super project; it has many size options and other than shortening the body and sleeves I didn't make any other changes. Everything matched up and did what it was supposed to! Always nice. 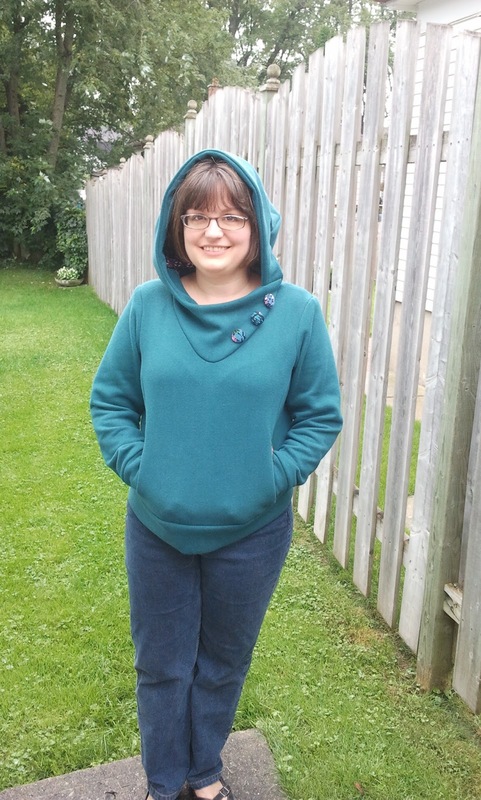 It will be a perfect addition to my fall wardrobe -- I lack warm and casual me-made items, so this is wonderful. 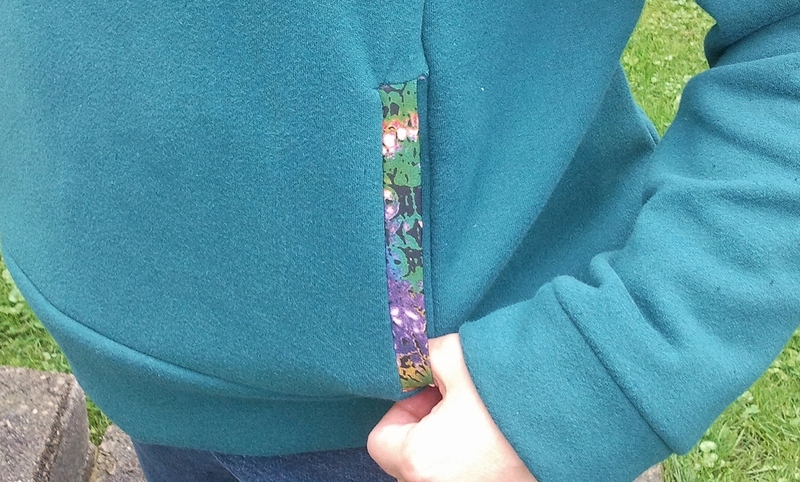 Not only is the bundle a great way to affordably try out some new patterns, it also helps a great cause. 20% of bundle proceeds will be donated to Womenfor Women, which helps women dealing with violence, marginalization, and poverty due to war and conflict. 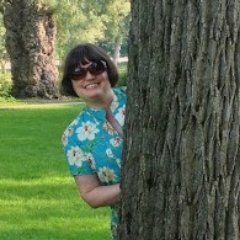 This year the Sewing Indie Month HQ will be SewIndependent, which Mari from Seamster Sewing Patterns took over from Donna, who decided to step back from the site. You can buy the bundle and keep up to date with the latest SIM news on SewIndependent.com. 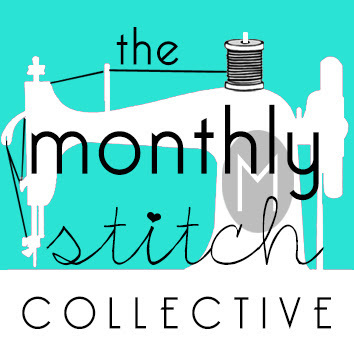 Sewing Indie Month (SIM) is a month-long celebration of indie sewing patterns where designers collaborate to bring you fun blog posts and informative tutorials. This year SIM is taking place in September. It's accompanied by a sewalong contest with fantastic prizes. Since the patterns in the SIM Bundle 2 are mostly knits, this sale gives you time to make quick projects for the contest while supporting small women-owned businesses and raising money for charity. And if you want to wander over to these other bloggers, they'll also be sharing their makes from Bundle 2 while the sale is on – always great for some more inspiration! Love it and the addition of the lining really makes it pop. Thanks - yes, I love the extra colours! Gah! I didn't know your were Canadian! Did you ever call them Kangaroo jackets? Great make. Such a precious term -- bunny hug! 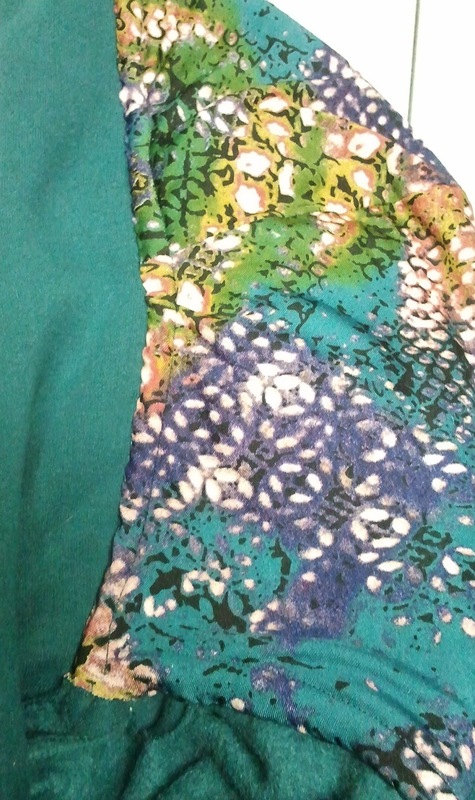 Rhonda is right that the lining really makes this! It adds that pop of color and such an interesting element. Love your version of the Jasper. 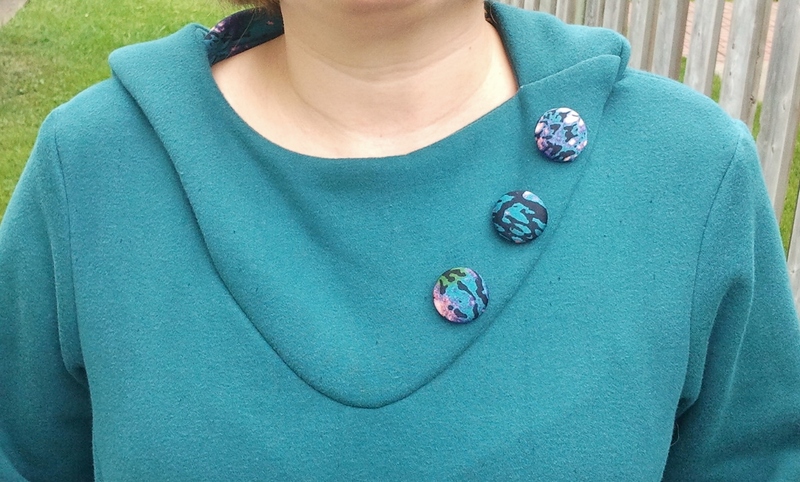 The contrasting lining and buttons are a lovely detail. I love your bunnyhug. I feel liberated being able to call it by it's true name (what I grew up calling them too). Great colour! !